• Refresh and rejuvenate at the Psychedelic Healing Shack, a "healing center" that combines a café with a holistic chiropractic practice. • Spend a rainy spring day at the Detroit Institute of Arts, home of the first Vincent van Gogh painting to enter a U.S. museum collection, Self Portrait with a Straw Hat. • Find local produce, products, and more at "The Sheds," hulking open-air markets that are part of the National Registry of Historic places. Michigan native Karen Dybis is a Metro Detroit journalist who has blogged for Time magazine, worked the business desk at The Detroit News, and jumped on breaking stories for a variety of publications. 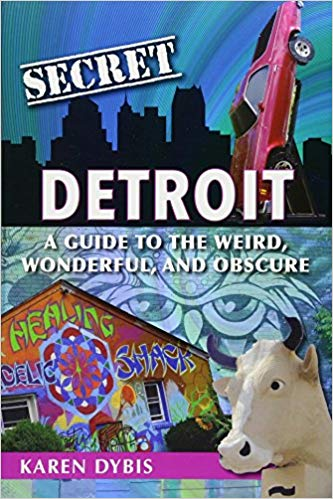 Dybis, a local history buff, is the author of two other books: The Ford-Wyoming Drive-In: Cars, Candy & Canoodling in the Motor City and Better Made in Michigan: The Salty Story of Detroit's Best Chip. Her favorite secret writing spot is the Kresge Court inside the Detroit Institute of Arts. Karen would be happy to discuss the springtime activities mentioned in the book. Please contact Don Korte at dkorte@reedypress.com to arrange an appearance or interview.